BMW F800ST (Lowered) 2007 - And its PINK !! This is my customized BMW F800ST and her name (and number plate) is "Barbe". 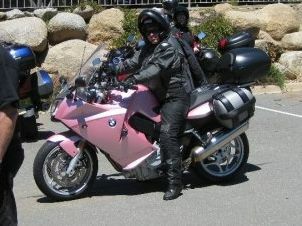 She is called Barbe as she has every accessory and she is pink as in the Pink Ribbon Ride color... Girls love her. Boys admire her but won't ride her.. I'm 5'2". Hope to get her to USA sometime to go to the F800 National Convention. But in the meantime, travel around Sydney and at some point the rest of Australia. Comments for BMW F800ST (Lowered) 2007 - And its PINK !! What a hoot!! I love it. Ah, here she is! Very nice indeed! Keep up the good work and I will start my journey with Pink leading the way.